If there’s one celebration that party lovers around the world anticipate all year — it’s New Year’s Eve. Unique in that it’s not a celebration limited to a single country’s culture, New Year’s Eve is truly a worldwide event and a spectacular one at that. 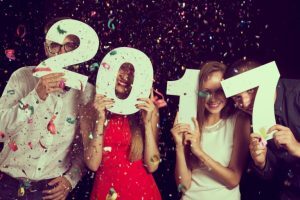 While some might be content to spend New Year’s Eve with a small party at their home or by celebrating with friends and family, many people elect to travel to celebrate in a new place and in a totally different style. If that sounds like you, consider choosing Niagara Falls. 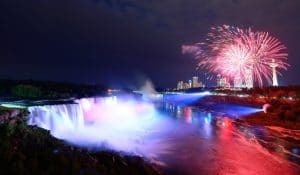 New Year’s Eve in Niagara Falls has become one of the most popular spots in regards to this celebration and given the fact that it’s such an easily reached destination from almost anywhere in the United States and Canada and even some parts of Europe. It’s also jam packed with parties, fireworks and light displays, exceptional dining, and fantastic deals on hotel stays. So if you want to do something completely different to ring in 2017 this is your ultimate guide to New Year’s Eve in Niagara Falls. Cheers! Queen Victoria Park is the heart of New Year’s Eve in Niagara Falls and you really don’t want to miss it. Beginning at 7:30pm the park is packed with food and drink vendors, live music, and thousands of other revelers. The trees in the park itself are adorned with lights but you also have a fantastic view of the falls and the fireworks at midnight. Even though it’s winter, expect to see lively costumes as people really tend to go all out for the biggest party of the year. So perhaps consider adding some flair to your winter wardrobe and add to the fun. One of the best things about New Year’s Eve, if you don’t count the champagne, is the chance to indulge in a wonderful dinner before the celebrations really get underway. Niagara Falls is home to some of the best restaurants and most respected chefs in the world. The only bad part is choosing which restaurant to make your reservation with, and you will want to make a reservation. Windows by Jamie Kennedy is currently Niagara’s hotspot for farm-to-table dining in an elegant setting or you could try The Rainbow Room by celebrated Italian chef Massimo Capra. The Skylon Tower with its revolving dining room is also a great choice. But remember, reservations! You’re not the only one who wants to treat themselves to an elegant dinner on New Year’s Eve. Many Niagara hotels offer great package deals during New Year’s Eve so it’s worth the effort to check them out. Packages generally include one or two night’s stay along with other perks such as special dining or drinking offers. In addition the hotels want their guests to have the best New Year’s Eve experience so they pull out all the stops. For instance, Sheraton on the Falls is offering a package that includes dinner, access to the private party, and champagne at midnight. The Crowne Plaza is offering a package that includes dinner at the aforementioned Rainbow Room by Massimo Capra. The best part of New Year’s Eve is the fireworks. Of course almost all major cities put on fireworks displays on New Year’s Eve, but few rival the light show you’ll see in Niagara Falls. The falls themselves are illuminated and the fireworks display starts at midnight, as one would expect. While you could watch the fireworks from your hotel room with a view of the falls, why not really get in on the action? The view from the Skylon Tower is magnificent or you could join the thousands of other party goers at Queen Victoria park. In addition to providing a great view of the falls and the fireworks it’s where all the other action takes place. If you prefer to stay out of the cold and dance the night away any of Niagara’s popular nightclubs will fit the bill. Dragonfly, located in the Fallsview Casino Resort, is very trendy and its Asian theme really makes it stand out. You can also try Rumours for great DJs and excellent service. Club Mardi Gras is probably the most popular club in town and, as you might have guessed, it’s almost as if you’ve stepped onto Bourbon Street. Great drinks and a great vibe means your New Year’s Eve here will be one for the record books. New Year’s Eve in Niagara Falls is truly an event you won’t want to miss. Don’t delay and get those travel arrangements booked, hotel stays confirmed, and dinner reservations made and start 2017 off in a really big way.